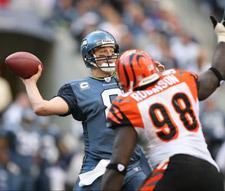 The Seattle Seahawks got a desperately needed win on Sunday against a Bengals team who needed the win just as badly.� This was not the high scoring affair it was built up to be as both teams had trouble putting points on the board. Carson’s interceptions came at bad times as well. Not that there are any good times to throw an interception, but after you put together a nice drive all the way down the field and you are in scoring position, throwing a pickoff in the endzone can really kill a teams momentum. Houshmandzadeh and Chad Johnson also had huge games with TJ catching 12 balls for 141 yards and a touchdown.� Chad Johnson caught 9 balls for 138 yards.� Although Seattle turned the ball over 2 times during this game, they were able to pull out the win in the final 1 minute of the game on a pass from Hasselbeck to Nate Burleson. This win puts Seattle into 2nd place in the NFC West just behind the 49′ers who got pummeled by Pittsburg.� Seattle and San Fransisco have the same record at 2-1 each, but San Fran has two divisional victories while Seattle lost their only divisional game against the much improved Arizona Cardinals. Last week, Seattle gave away the game with a botched handoff attempt between Matt Hasselbeck and Shaun Alexander.� Matt had called an impromptu fake audible but he ended up fooling half of his team including Shaun.� This put Arizona in prime position to kick a field goal with time expiring to steal the game. �The Bengals defense looked better this week than they did last week when the Browns scored 51 points on Cinci in a crazy shootout but it now leaves the Bengals in a rough spot as they are now last in their division with a 1-2 record which is the same record the Browns hold.� Will the Bengals be able to rebound and rise to the level of the 3-0 Steelers or the 2-1 Ravens?� Possibly, but I won’t hold my breath.